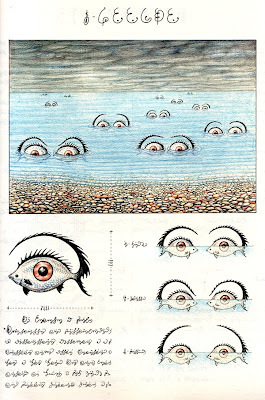 CODEX SERAPHINIANUS. Franco Maria Ricci, Milan 1981. VALUE? A book that used to be easily found and I wish I had kept a few. All editions, even latish reprints, seem to command at least a $100, the first US was by Abbeville in 1983 hard now to get at less than $250 and often more, but not scarce. There are about 6 different language editions, one of the few books where it doesn't matter too much. These came out in 1993 and were limited to 5000 some signed and go for $400+. I've never understood where all the copies of this went. A limitation of 5000 is hardly small for the original two volume FMR edition; and really shouldn't be scarce (are they all sat in a warehouse someplace, or what?). As noted, the one vol reprints are not difficult to come by, in any of the languages it had the introduction in, but still sell well. For the real rarity, you need to see his 'other' second book - Pulcinellopedia, and there are pictures and a small tale of finding it via an italian out of print website at: http://www.spamula.net/blog/archives/000182.html .. Sadly when I tried a similar hunt a year or two later, it was available but then on ordering was unobtainable. . . 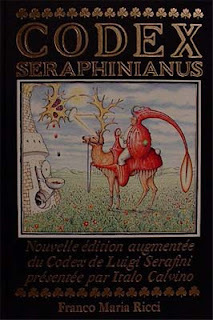 Some wag has that plus the first FMR edition of the codex at 4000USD. Ouch. I had six copies. Tore the pages out to line the bottom of my gerbil cage.